Owl’s Rock is the Upper Midwest’s number one get­away for physics grad stu­dents whose apart­ments have been destroyed. Did she cross into a dif­fer­ent time zone to travel through time? If not: please pro­vide more time travel. As a pos­si­ble future physics grad stu­dent, I will be sure to remem­ber this. Gasp! I’ve made it through all the archived work! Great job, John. And, um…sorry Greg. I’m sure you’re awe­some, too. Gosh, 85mph at 2500rpm. That’s quite a pow­er­ful car she’s got there. Kib – it’s all in the gear­ing. is this sup­posed to be nova scotia? i’m gonna pre­tend owl’s rock is actu­ally the bay of fundy. k deal! @Speed Racer: I have to ask, do you drive real fast? I’ve just started read­ing from the begin­ning, work­ing through to the end… I don’t really ever com­ment on things, this is a great story though! I appre­ci­ate the desire for more time travel, as that drew me here to start with, but the char­ac­ters and set­ting is real great too. 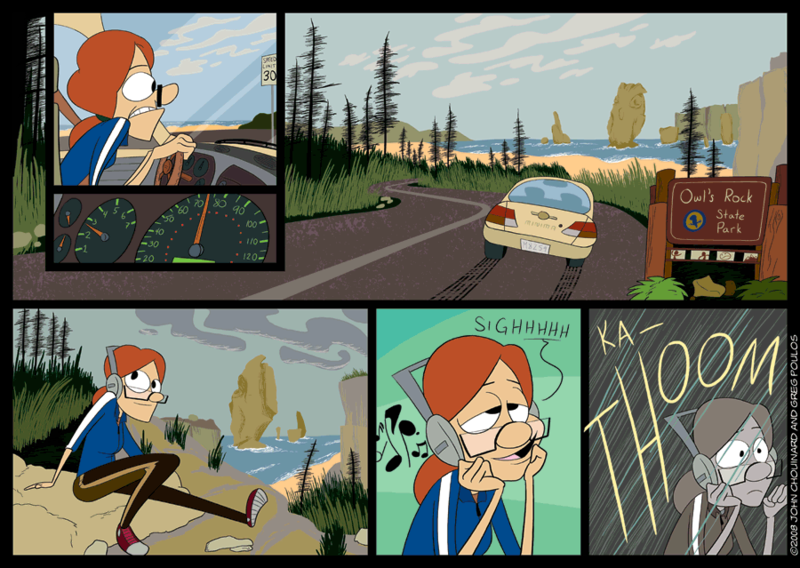 I really posted on this strip, though, because it just reminds me of Cannon Beach in Oregon a whole lot. Anyway, great work guys!